Best available primer for galvanised iron surfaces, with excellent adhesion properties. 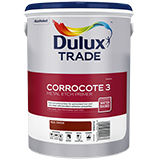 An excellent anti-corrosive primer for use over abrasive blast-cleaned steel (cleanliness standard Sa2½). Can be over coated with most commercially used paints, both solvent- and water-based.